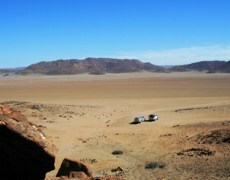 This route follows the C34 in a northern direction and turns inland 2km north of the Cape Cross turnoff. The Messum Crater, a wide flat basin of 25km in diameter, is popular with visitors because of its utter desolation and breathtaking views. 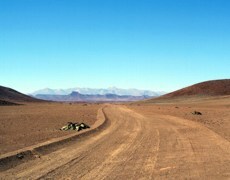 Interesting phenomena on this route are huge lichen fields, excellent specimen of the famous desert plant, Welwitschia mirabilis, and many other species of desert plants. There are also valuable archaeological sites in the area like these stone circles used by ancient Damara nomadics. 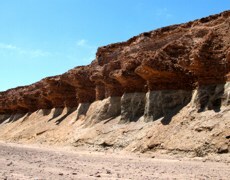 The walls of the Messum River are carved through eons into spectacular formations like statues.